on Sunday afternoons from 1 p.m. to 4 p.m. The museum is also open by appointment. To make an appointment, call Museum Director Kathy Bach at 860-872-7718. View a virtual tour and get a sneak peak of what the museum has to offer. Each month, a different panoramic view will be shown. A stone jail built in 1856 and operated until 1968. The attached 1893 jailer’s home displays furniture and collections depicting Tolland life and industry in the late 19th and early 20th centuries, and the shed features woodworking, farm and outdoor work. 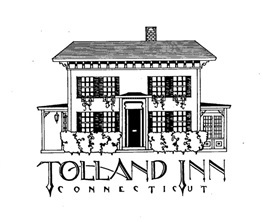 During the 19th Century, Tolland was the hub of law and order for all of Tolland County. 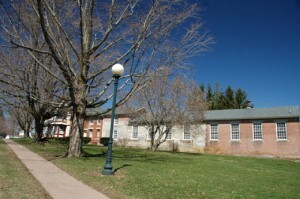 All those who broke the law in any of the towns of the County were tried in the Courthouse, and, if found guilty of misdemeanors requiring jail time of up to one year, would serve their time here, probably working in the barns and gardens on the property and on the 100 acre farm property where the Middle School is today. They might also be assigned to work in the kitchen. 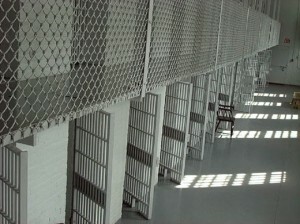 moving on to the state prisons, occasionally returning here for a year or less. They were not allowed out of the cellblock to work while awaiting trial. The earliest portion of the jail itself, the stone (center) section dating from 1856, was the fourth jail built here. The brick section was added in 1893. The jail was operated by the county until 1960, and by the state from 1960 to 1968. The 32-cell facility is of interest to young and old. Even some former inmates have visited the jail, and have told stories of life at the old “Hollyhock Hotel”, as it was affectionately known. jail. 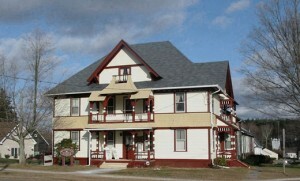 It was known as the County House. People having business with the courts, and other travelers, needed a place to stay, meals, and a livery stable to provide transportation or tend to the needs of their horses. After the courts moved to Rockville, the hotel was no longer needed, and when it burned to the ground it was replaced by a residence for the jailer and his family. The museum contains a vast array of fascinating items depicting Tolland life in the late 19th and early 20th Centuries, most of them donated by townspeople and actually used in town. The Museum offers a Summer Internship Program for students entering grades 7 thru 12. Display construction, artifact care and accessioning, and docentships are a few of the skills that are learned. Interested students should contact Museum Director, Kathy Bach at 860.872.7716 (home) as soon as possible. You will find seasonal displays and weekly events from mid-May to October. Watch for our 2015 Schedule of Summer Sunday weekly events which will be posted below!!! We are a Blue Star Museum offering Military families free admission from Memorial Day to season close (this is longer than the National program). items from the Tolland Historical Society collection and local collectors will be on display throughout the museum. We welcome any inquiring incoming 7th to 12th Graders. Current Interns will gladly tell you about their adventures at the museum and answer your questions. A tour will follow. Plan 1 to 11/2 hours. Can’t attend on the 9th, no problem! 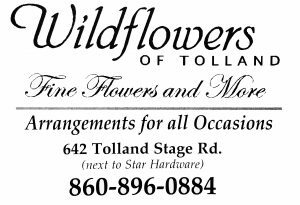 Give Mrs. Bach a call at 860.872.7716 and arrangements can be made for a more convenient time. Not sure this is the program for you??? Stop by at Orientation or on a Sunday and check us out…no pressure. Enjoy Memorial Day Parade from our porch and visit the museum before or after the Parade (Some do both!). Refreshments will be served. We are still busy planning our season and we want to include you. So drop us an email at: jail@tollandhistorical.org with your ideas or visit us on Facebook and leave an idea there…and don’t forget to “like”us when you visit Facebook! Oh and stop by and see what we’ve been up to in the museum…it never looks the same! We always are looking for your input there too! The Interns are eager to practice their touring skills! There’s nothing quite like an old fashioned family picnic. So pack one up and join us on the lawn or at the picnic tables indoors (jailbird style) at the Jail Museum. Or maybe it is more your style to just stop by and grab a glass of cool lemonade and dessert. Whatever your pleasure, drop on by and see what’s happening. There will be planty of games and family stories of the “old days”! 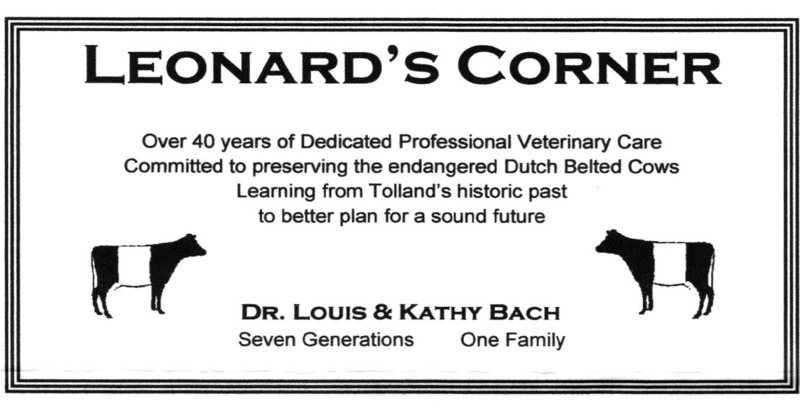 There will be stories of old Tolland being told during the afternoon. Discussions of men’s industry in the late 1800s and demonstrations in the shed display area, refreshments in the dining room. Bring dad, grandpa and other significant men in you life! Let’s talk about what school was like in the ‘olden’ days when you walked there up hill…both ways! The focus will be on what children did back in the 1800’s from sun up to sundown…stories and artifacts. Experience says these are the “dog days” of summer so we chose slower activities. These games are indoors and out for the family. Tours and refreshments available. Waterbury native, Charles Monagan will talk about his new novel “Carrie Welton”. Weldon died climbing the Rocky Mountains, but was otherwise an an enigma. In his story, Monagan invents a series of high-wire adventures for 18 year old Carrie. Come hear about the author, his character, and his other books. There will be books to purchase. Admission is free, cost of novel is $20. Tours of the museum and refreshments are available. By request we are bringing out some of the stories about our landmarks and people. It’s all in celebration of the historical society’s 50th Anniversary. Tours and lemonade! First the work, then select a bakery item to spread your fresh butter on. Always a treat. Goes well with a refreshing beverage while you tour the museum. Demonstration in the shed display. We do it the old fashioned way….crank style…and is it ever good! With the right help we might even have more than one flavor! 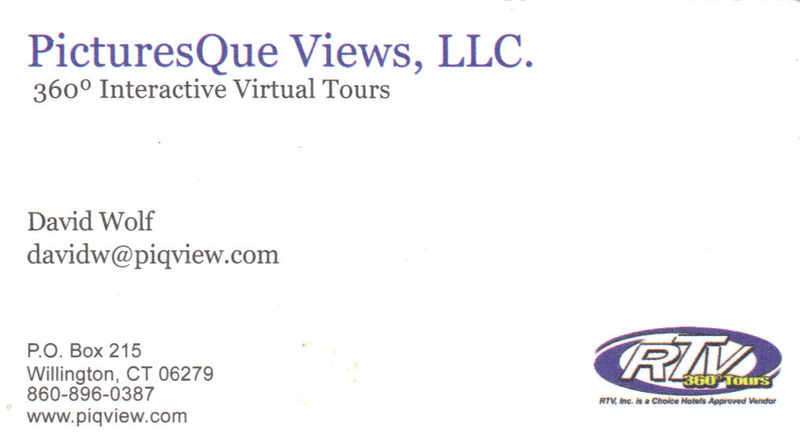 Tours as well. Special offering by a visiting guest from the Orange Historical Society. Join Ginny Reinhard, President of the Orange Historical Society, as she demonstrates and teaches this wonderful craft. All participants will have the opportunity to make a candle. The big loom will be in operation. Bring your questions. Tours and refreshments available. Bring your favorite photo, story or person. We are remembering these important people in our lives and honor those we lost on and following the attacks of 9/11/01. Refreshments will be served. Bring the family and join us for some favorite old time games on the south lawn. We may also enjoy some 20th century style favorites as well! A national colabrative with the Smithsonian to open museums to the public. We hope that you take advantage of this opportunity. If you are a Smithsonian member, remember to bring your coupon. Join us in the shed display area for discussion and and book signing. This is the captivating love story of our own Benton family. Your visit is geared to the entire family. We apologize for this unavoidable last minute change BUT we do have books available for sale! An Open House and Reception for our society members. Tours and refreshments provides by our Student Interns. There are demonstrations of wood carving, chair caning, weaving and rug braiding in the shed classroom on Sundays. There’s always a Sunday event at the museum! Remember…we are closed July 3 and September 4 in observance of Independence Day and Labor Day. Here are some photos from past seasonal museum displays & events: Click on thumbnail photos for slideshow.